Greeting visitors and setting the stage for an incredible atmospheric experience, the George Stanley Fountain at the entrance of the Hollywood Bowl is a massive water feature with three large granite sculptures depicting the muses of dance, music, and drama. At night the lighting situated at various points around the sprawling fountain creates an iridescent ambiance surrounding the muses, spillways, reflection pools, bubbler jets, and tiered troughs. After decades of deferred maintenance and eventual non-use, the fountain had accumulated a variety of problems. These included cracked, spalled and stained granite, wholesale failure at all the mortar joints, and shifting blocks of granite. Some of the anchorage for the granite cladding was corroding, including some of the steel reinforcement at various parts of the concrete substructure. All the plumbing, electrical/lighting equipment had long since ceased to function. During one previous restoration attempt, green ceramic tiles had been applied over the face of the granite spillways. In 2006, when the Los Angeles Philharmonic Orchestra and LA County Department of Parks & Recreation decided to undertake the complete renovation of the Hollywood Bowl entrance and fountain, the project team enlisted the expertise of California Restoration & Waterproofing, The California Restoration Specialist TM. Our task was to completely restore the fountain with all of its original water and lighting features, including installation of 1,500 lineal feet of new fiber optic lighting throughout the fountain’s many tiers. • Remove all the old mechanical and electrical equipment. • The stainless steel weirs were removed, cleaned and stored for later reinstallation. • The materials custom matching process was initiated early so that the first samples could be mocked up and reviewed by the architect and owner. Opting for one of the least aggressive cleaning methods available, CRW cleaned all of the granite by means of soda blasting. This method, while very effective at removing most surface dirt and staining, would not damage the Lucerne granite. • The granite pieces that had shifted were reset. • Cracks in the granite were injected with polyurethane resin. • Granite spalls were repaired with the custom repair compound. • Repointing occurred at granite joints. One of the challenges we faced was installing all of the electrical and plumbing equipment in such a way that none of it was visible from the street. Without the benefit of any structural drawings, and not wanting to inadvertently weaken the hidden network of steel reinforcement, we had to be careful what and where we cut. • Cut holes through the concrete and granite for routing of pipe, conduit, and the 1,500 feet of fiber optic lighting. • Solved one problematic location by slightly widening a tall vertical joint near the muse of dance and recessing the piping along the full height of the joint. • Mocked up a series of night lighting schematics to provide the owner and architect ample opportunity to make adjustments. • Adjustments were also made to the volume of water at the spillways, and the height of the bubbler jets. 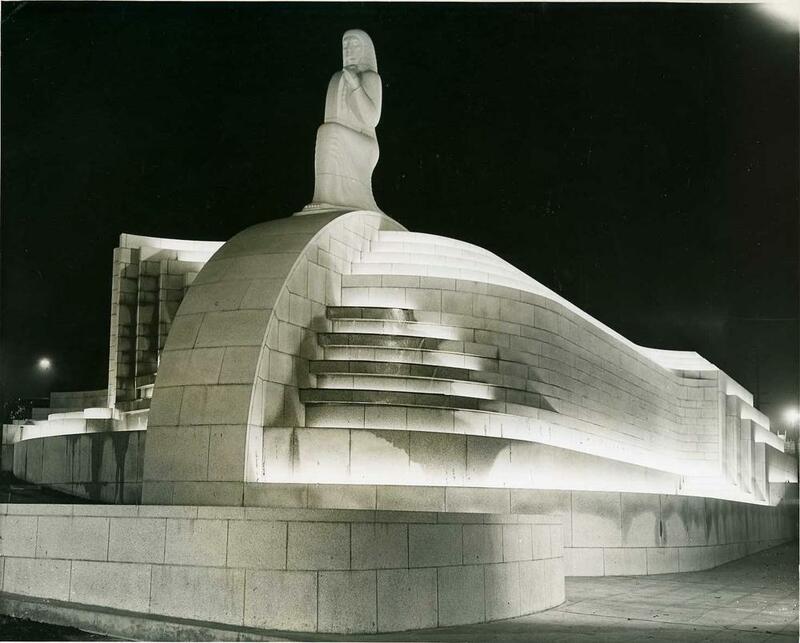 One of the more remarkable federal art projects commissioned by the WPA in Los Angeles, local artist and sculptor, George Stanley, designed this 200-foot long, 22-foot high art deco sculpture. Stanley is most famous for his design of the Oscar statuette.